New cut for both of us. I have been so busy with the JOB, family, and Hair that it has been impossible to get myself together enough to post pics. First off I trimmed the hair some more. It was getting so heavy, so trimmed it to just past my shoulders. I also trimmed the baby fat. Yes indeed your girl is in a good size 12 now after one year of hard work and determination. I CUT baby boy's hair. I couldn't keep up with the 2 hour sessions every Sunday with him and his hair. He is so happy with it. He goes to the barbershop with his daddy every two weeks and he sits all by himself for his cut. Such a big boy. Happy New Year! Introducing my newest client...my son CJ. Look at all of that hair. He is very particular about his hair too. 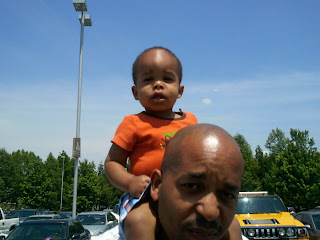 9 month old loves to touch his hair but don't want me or anyone else near his hair...PERIOD!! He loves for me to lean him back in the sink and wash his hair and condition it but after that treatment is over he is not having it. Well, I just received my order of Oyin with a 8oz of Whipped Pudding, 2 orders of Greg Juice, and Go Tea (for the hubby). That Whipped pudding came in handy today. After washing that massive afro I applied some Oyin Honey Hemp conditioner and rinsed. I dried that afro and massaged some Whipped Pudding in. I took his baby brush and brushed it to the tips. Once he was sleep I began semi parting with a comb and my fingers and plaited his hair up. As you can see his hair is EXTRA curly and I can't braided it all the way to the ends because it just slips out of my fingers so I let it curl up. He loves it! He can't stop touching and twirling it. He can't take the cornrolls so I will just do this once a week. He is more high maintenance than my own locs which have grown. The edges where I lost some hair due to hormones have grown back. The layers are growing out and it is just long and full. I love it but with my hair and his hair...MAN what a weekend. I have a full time job now and it is not as stressful and I am making progress there. My skills and experience are definitely acknowledge. Plus to add to that the company will be moving to my county so that commute time will be cute down by atleast 20 to 30 minutes. YES! I can take all street if I want. I took a pay cut but what I have learned is with more money comes more responsibility and expectations. Right now I am more focused on my family than the career. I lost the baby weight now I am where I started and I need to lose 15 to 20 to be healthier. It is definitely hard to go to work, pick up the baby, and try to fit in a workout. So today I went shopping for a new chic lunch bag, salad and lunch to go containers. I also invested in a good 6" Chef Knife for my everyday kitchen needs. I also purchased a slicer. I plan to do a 10 day detox where I am going to focus on eating fruits and veggies mostly raw with beans and protein shakes for my protein intake. No excuses! I have a treadmill, p90x, Tae Bo, weights, and all kinds of equipment in my basement so I should be all set. I still will try to get to the gym maybe 2 times a week when my hubby is home so he can get the baby. It all goes down TOMORROW! I have Monday off so I am going to do my first day of detox tomorrow. I thought I would share a little bit of knowledge with you concerning Sisterlocks. The reason why I want to share this information is I have a couple of clients who have been going to distance in between maintenance appointments. 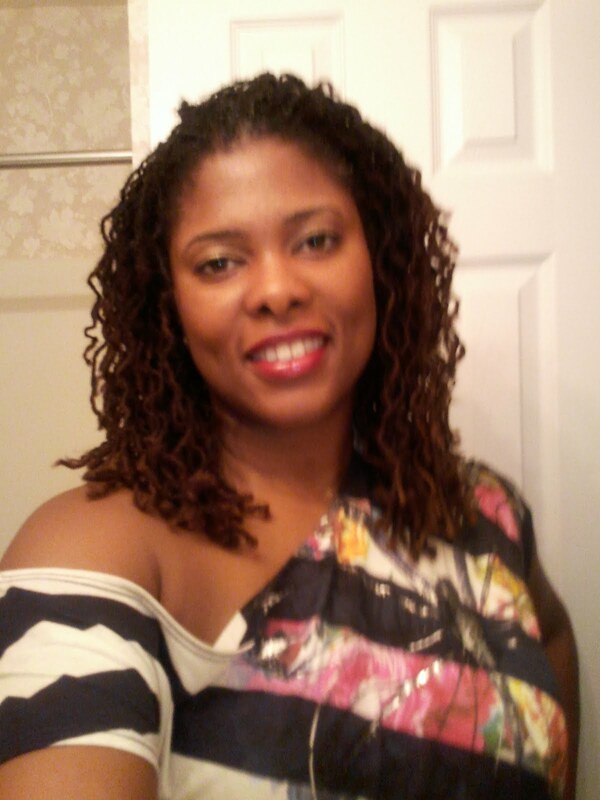 Let me explain why 8 weeks and beyond is harmful for your Sisterlocks and your pockets. This only pertains to those of us who have average growing hair. First let me address the issue of weakening Sisterlocks. When you continuously go 8 weeks and beyond for your re-tightening your new growth will cause problems at the base of the locks. Even the most diligent client who takes time to separate the Sisterlocks at the root will have problems with new growth over half an inch. Once your hair begins it's locking stage that is what your hair wants to do naturally so it will begin to mat at the roots. Running your fingers through that new growth will snag and pop locks and you don't know what hair belongs in what lock. Keep on snagging and popping locks and you will notice that your Sisterlocks are weaker at the base than you remember. You will also notice small fraying hairs at the base of your locks. Is that new hair growing in? Could be....but if your locks are thinning at the base you most likely snapped those hairs from the lock. How can this be fixed? Your Sisterlock Consultant can incorporate those smaller clusters of hair into the base of the Sisterlock creating a stronger base. Yes that helps the base but now you have a thin spot in your locks that will eventually pop off at that spot if you are not careful. If your Sisterlock Consultant is crafty like myself that weak spot can be helped as well. Longer times between maintenance = more money when you finally come to see me. The reason I charge more for clients who go longer between maintenance is that I have a lot more hair to work with and it takes me longer. Period point blank. I also charge more for locks that require any fixing, weak locs, holes, etc. Longer times between maintenance can be painful. Extra new growth will mat together and if you haven't done your work and separated your hair I will need to separate for you. It sounds a little like velcro and it feels like some one is playing tug o war with your Sisterlocks. I have even had to cut come Sisterlocks apart because they were matted together so badly. Just thought I would share this with you as a Sisterlock Consultant. Hope if helps someone out there. Even if I help other consultants by motivating clients to schedule regular maintenance appointments every 4 to 6 weeks then I consider my work done. Are you currently researching Sisterlock? Have you completed your research and ready to have your Sisterlocks Installed? Do you know someone who is ready for a Sisterlock Installation? Locks 4 Life Atlanta is now offering special pricing for all Sisterlock Packages installed on a Weekday. Please visit www.locks4lifeatlanta.com or call 770-845-6241. Well I know you guys are probably wondering what is up with her title. Well the book Who Moved My Cheese is all about change and how well people handle change. My life has been changed upside down since my son arrived and I must say I like it. Prior to my son I was so career focused upwardly moving in my positions and salary. Now I am not that interested. It is great to have income coming into your home but to what do you have to sacrifice to earn that money? Shortly after giving birth to my son I was laid off. Thanks for all the hard work on these projects Katrina but we don't have a job for you anymore. Wow!! I am talking about I came back June and they laid me off July 2nd with a 1 week notice. I received severance pay and shortly after that lay off I received another job offer. Everything in my sub-conscience, my spirit, and better judgment told me to pass on the offer but I accepted for the benefits and the income. Everything about the interview process was unorganized and just plain ole concerning. Let me just say that my first week I was like WTF!!! My boss kept asking me to...Please come back. In my mind I was like this is not good. Not to mention how rough it was on my son. The job was 27 miles away from my house but with the traffic it would take me 1 hour to 2 hours just to make it to work. My son was in daycare from 6:30 AM to 6:15 PM and it manifested in his spirit. He didn't want me to put him down when I got home. When I went from his sight he would scream. I kept on pushing on until just last week. I put up with a job that was unorganized, no support from management, no accountability, no documentation of anything, and all kind of other drama for about a month. They did me a favor and ended it with a termination because they said the client didn't like my style or technique. WOW! Never heard that one before, but hey I was two seconds from quitting. Thanks for the favor. I won't even include that mess of a job on my resume. Get this when I did a Google search on this company I found over 7 pages of complaints. This is a private company so I couldn't do much research prior to accepting this offer. Maybe I should have taken some more time. Yes! Unfortunately the recruiter and HR Manager were really pushing me to sign and accept the offer as quickly as possible. Now I know why!! How is my baby doing? Well, I am doing my best to break him from this spoiled state that he is now in. He doesn't want me to put him down at all. He screamed for an hour today because I nor his father would pick him up from the swing. He wasn't wet, hungry, or sleepy. He just wanted us to hold him. I do understand how this happened with him being in daycare from 6:30 AM to 6:15 PM for a month. It was way too much for him. Since birth he has never been there that long before and some may say a child that young doesn't know the difference. I beg to differ!! You can see the children faces when a parent walks in the infant room. That hope it's my mommy or daddy look. My son's face would light up when he saw me now it is get over here now and get me. I really regret taking that job and I am paying for it now. I never thought I would be here typing this or saying the words out loud. I always thought I would never be able to stay at home with my children. Now that he is here I think differently. No one can teach him better than I can. This change has been really good for my soul. I have this glow about me now. It is about something greater than just money and job status. I thank God that he has enabled my husband to have a job where he is taking care of us well. I continue to look for the right opportunity but it won't be a decision based solely on money. It is about a company that is empathetic to growing families and mothers who are working. The company must have a defined career path for me. I need a company that will appreciate what I have to bring to the table. I need a company that I can retire from. If you know of a company in my area that fits what I am talking about hit me up and let's network. Just because my cheese changed from Swiss to Baby Swiss it is all good because I can roll with this change. Change is good!